My name is J. B. Garner and I’m a starving independent writer. Alright, technically not starving, but definitely independent. I had a love of writing ever since I was young, but spent decades of my adult life getting the courage to try to do what I love. My first novel, Indomitable, is for sale in its proper second edition form. I am self-published for the primary reason that I wanted my books read. I wanted, regardless of the system in place, to have my works out there to be enjoyed, even if I wouldn’t make huge stacks of money off of it. I also figure, at worst, I can always shop my works to agents later, after they’ve been honed under the critical eye of the readers. I first started writing when I was very young, if you count crayon comic pages. English was always one of my favorite classes and I voraciously read and wrote throughout high school. I would say I really had the passion to become a writer sometime during those years. I turned away from the calling during college and my problem years after, but I never lost the urge, I just repressed it. Now I feel much better being back into the full swing of writing. The thrill of creation keeps me going, at the very heart of it. Now that I have done it, I am kind of addicted to it and I’d suspect I’d keep going even if I didn’t have a single reader. Stephen King, Dashiell Hammet, J. K. Rowling, David Eddings, and Harry Harrison. As for current reads, I’m just starting The Thin Man by Dashiell Hammet. Shockingly, I kept missing out on this one when reading other Hammet pieces. Though I do like my Nook, I still have a warm place in my heart for a good paperback. I think it’s primarily nostalgia; there’s a certain visceral comfort to the smell of print and the feel of pages in my fingers. I write in the first and third person, depending on the piece. Each point of view has its advantages and disadvantages, so I use the right tool for the right job. As far as tense, so far I don’t stray from the past tense. Present tense pieces always read oddly to me and it’s very easy to make continuity and tense mistakes writing them. It depends on my current writing status. If I am in full-on ‘Muse-driven’ writing mode, I don’t read much, so that would be a break. Otherwise, I tend to read constantly, even if other work restricts me to a few pages a day. I’m a ‘one-book-at-a-time’ sort of guy. With all of my writing this year, my reading is a bit sparser than normal, but I would say I’ve managed at least ten books this year. By BISAC terms, it’s solidly Fiction > Superhero, but there is definitely a strong touch of sci-fi and urban fantasy. What separates my writing from a usual superhero tale is looking at it through the lens of an Earth going through a total reality change and the aftermath of dealing with for the people that know what actually happened. In some ways, it’s both a deconstruction and reconstruction of the superhero idea at the same time. I’ve loved comic books and superheroes since I can remember. As I grew older, I continued that love, but I started to think about them through the lenses of maturity and critical analysis, and that ultimately led to this. I would say I targeted this for the adult reader, but it definitely is within the reading and maturity level of a young adult audience as well. As far as gender, I try to appeal to both men and women. The protagonist is a woman, but all kinds of people are present among the main characters. Irene Roman never wanted to be a hero, but when a strange betrayal brings literally changes all of reality, she may not have a choice. Now the Earth is filled with superhumans, both good and evil, and Irene is one of the only people on the planet who knows why and may be the only person in the world who can set things right. What price will Irene pay to be the hero she never wanted to be? When I’m in ‘work’ mode, I write daily. I try to think of it as a normal 9-to-5 job to keep a sense of discipline and keep me from slacking off. From 2,000 to 5,000 words on average. I do a few rounds of self-editing and then send it off to my small network of beta readers to edit more. I start with a general story outline and beginning character notes. Once I have a basic framework, I start chapter by chapter, re-reading and doing a basic edit on each chapter after I finish. When I run into conflicts between the way the story is starting to turn versus my original outline, I move events around, add events, or totally erase and redo parts of the outline. I almost always go with my instincts while writing and my betas’ input over the original outline. I think flexibility is key. I must, because once an idea takes root, I have to get it on paper. When I get inspired, I only pause for the most basic of human needs before getting back to it. Generally a month or two. No, though I do try to keep myself to a limit of eight hours at the keyboard and a minimum of six hours at it, both to prevent burnout and enforce discipline. Still, I’ve broken that eight hour limit when particularly inspired. I browse baby name books and information appropriate to the cultures the character comes from. For places, as my books so far are set in modern Earth (or a reasonable fascimile), I’ve used geography straight from the map. For business names, I generally look up a few similar businesses and try to get an idea for naming conventions from there. I try to outline chapter by chapter and jot down a sentence to a paragraph per chapter, then a paragraph or two about the major characters. It would probably come to a few printed pages. As I start the project, I generally flesh out the notes for the next few chapters as I finish one and the story arc becomes more clear. I am a coffee addict. I can’t get started without a cup of coffee in me. I do all of my writing at my computer. I tried using my tablet, but my giant ham-hands do not agree with virtual keyboards. I do most of my work in the morning hours and generally try to limit myself to an eight hour stint. I have managed to mitigate that by matching my writing times to the work times of my family. Still, once in a while, the muse beats out mundane problems. I can’t say I’m totally happy with that, but I see it as a trade-off or occupational issue the kind of which I had dealt with for the rest of my professional life. 30. What is the quirkiest thing you do or have ever done when writing? I totally restructured the story arc for an entire novel and trilogy after realizing the throw-away antagonist I wrote in the first chapter really should be the second protagonist of the novel. 31. If you have written more than one novel, which is your favorite and why? I really don’t have one. Both of the series I am writing speak to very different but equal childhood loves and both have characters I feel a strong connection to. I can’t decide! 32. If one of your books became a movie, who would you choose for the “perfect cast” of main characters? As much as I would love to see Indomitable as a movie, the very thought puts my brain into a strange sense of shock that I just don’t know who I would cast for what. 33. What is the oddest thing you have ever researched for one of your books? The decomposition of a dead body after being drained of blood. 34. What is the most difficult thing you have ever researched for one your books and why? Thank you, J.B., for allowing me to interview you. I hope everyone else has enjoyed learning about you and your work as much as I have. As we draw an end to our “Goosebumps” theme this month, I want to wish all of you and your families a safe and happy Halloween and a phenomenal weekend! I hope your treats outnumber your tricks. Have fun, but don’t eat too much candy. I had so many “goosebumps” stories this month, I had a hard time narrowing them down to only one a day. So this bonus post will be my actual Throwback Thursday. With Halloween only one day away, I thought a haunted house story would be most appropriate. One other thing of noteworthiness, please take note of how I used an excessively bold, fancy, O in “Once” at the beginning of the story. When I was little, if a book had the fancy O, I just knew an awesome story would follow. Once upon a time, there was an old house. Nobody lived in it for it was haunted. A skull [scull] was in it and old bones, too. 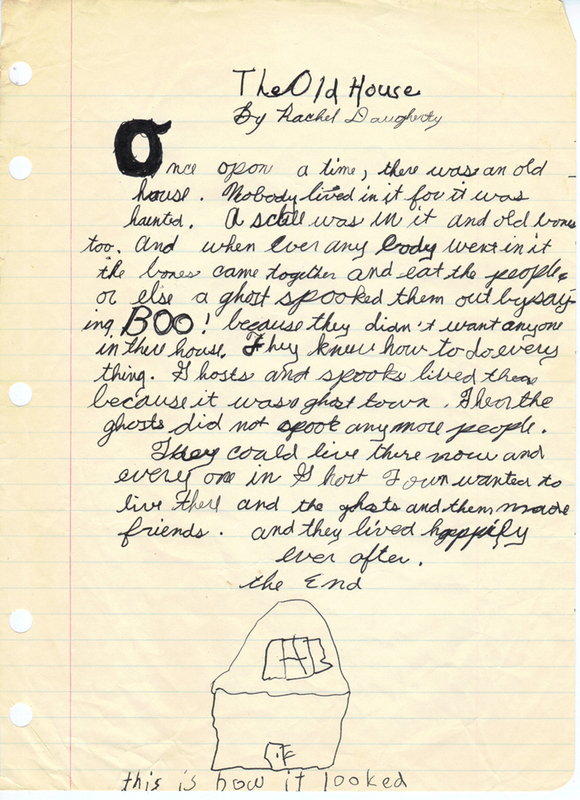 And whenever anybody went in it, the bones came together and ate [eat] the people or else a ghost spooked them out by saying, “BOO!” because they didn’t want anyone in their [there] house. They knew how to do everything. Ghosts and spooks lived there because it was a ghost town. Then the ghosts did not spook anymore people. Let’s talk… Did my story make you laugh? Did you used to notice the fancy O at the beginning of “Once upon a time?” Would you have been afraid to go in this old house before the ghosts made friends with everybody? Many of you have heard me talk about my Aunt Susie before. Aunt Susie was my Grandma’s older sister and actually helped raise Grandma. And since Grandma raised me, I spent a lot of time with Aunt Susie, too. Aunt Susie loved to sing and write silly songs and poems. (You may remember one of hers I featured back in Poetry Month.) When I was little, Aunt Susie’s husband, Uncle Paul, would often drive us to Susie and Grandma’s hometown which was four hours away. (Actually it’s three hours away, but not when he drove.) He only took back roads, and just because there was a speed limit did not mean one was required to actually drive that fast. It was just a “suggested” speed. Uncle Paul had been a Navy man and worked in the boiler room on a ship during WWII. Grandma said it was for this reason that he never used the air conditioning in his car or even allowed us to roll down the windows. (Yes, really!) (He also refused to ever turn on the radio because it was “distracting.”) I didn’t care why — We lived in Florida, and it was sweltering, and the car smelled of sweaty old people before we were halfway there, and it made me want to throw up, and I often did. Fast forward several years. When Aunt Susie got older, she got Alzheimer’s disease. Uncle Paul died, and Susie had to go live in an assisted living facility. She was there several years until she got really bad and they transferred her to a nursing home. Aunt Susie had only one child, a daughter, who lived in Texas. The daughter flew in when she had to make initial changes, but she otherwise left a lot of the day-to-day stuff up to Grandma (which I never though was fair because Grandma didn’t drive). So, that meant when I was younger, I usually accompanied Grandma and we took a cab (which I always hated and found incredibly embarrassing). And once I could drive, I was the chauffeur as Grandma liked to call me. When I was in my early twenties, the nursing home called. They said Aunt Susie was “ready to die.” She’d been non-responsive and lethargic for days, and she could go at any time. They said if we wanted to say a final goodbye, we should get there soon. So, I called my boss at home to explain why I wasn’t going to work that day. His wife answered, and I talked to her. She’d been a head nurse at a local hospital for several years, and she said that sometimes people hold on past the time they should die because they’re waiting for something. In this case, Susie was probably waiting to see her daughter one last time. My boss’ wife said that oftentimes you literally have to tell the person it’s okay to die. As I drove Grandma to the nursing home, I explained everything my boss’ wife had said. We were both furious that the daughter didn’t come in when we called her but rather said to call her after Susie was gone. Looking back, I guess she couldn’t get off work twice; or maybe that’s just giving her the benefit of the doubt. Anyway, it doesn’t matter. Grandma said there was no way she could tell her sister to die. When we got there, Susie looked like she was asleep with her eyes partially open. If her breathing wasn’t so labored, I’d have thought she was already dead. We held her hand and talked to her, but she didn’t move a muscle. The nurse said she’d been like that for about three days. I left Grandma alone with her for a couple of hours, and Grandma talked and wept a lot, reminiscing about their childhood. When I got back, Grandma said she couldn’t bear to leave and let her die alone. So I encouraged her to give Susie a little push. But Grandma said she couldn’t do it and asked me to. As I sang, Aunt Susie’s eyes opened wide. She turned her head and looked straight at me, then struggled to sit up. I kept singing, and she made some gurgling noises. Grandma stepped out and flagged down a nurse who then stepped in behind me. I kept singing, and Aunt Susie kept gurgling. I stopped singing momentarily and said, “You don’t have to stay here. We’ll all see you again soon enough.” Then I started singing again. Aunt Susie just stared at me and made gurgling sounds, and tears streamed down her cheeks. Then, as the song ended, she gently laid back, closed her eyes and took her last breath. It may sound like it was a hard moment for Grandma and me to witness, but it was actually very peaceful and I was honored to have been with her to help her along her journey. I left Grandma there to sit with her body for a while longer, and later that night, Grandma asked me to do that for her when the time came. And I will. This concludes my “Goosebumps” theme for October. I hope I didn’t offend anyone or scare anyone away. And I hope you liked it better than last month’s “Games” theme. Time to talk: Do you think Uncle Paul should’ve been arrested for not rolling down the windows? Do you think Grandma was mean to have spanked me for throwing up? Do you think Aunt Susie was littering when she threw out the ends of the beans or the pecan shells? Would you ever tell a loved one it was time to die? What story themes would you like to see me tell in November or December? I’ve learned over the years to trust my gut feelings and to go with them no matter how oddly timed they might be. There’s an inordinate amount of times that I was at a hotel with my sister Michelle and our bestie, Lora, and we were ready for bed when suddenly I needed to take a walk right now, only to find that our band friends checked in early and were arriving right then. A couple of years ago, I’d done some Christmas photography for a client who lives about thirty miles away. By the time their holiday cards came in, I called them, and they told me I could drop them off at their parents’ house right around the corner from me. My sister and I went, but the gated community had a closed gate, and we couldn’t get in. So, I called the people, and they said they’d try to get out to pick them up during the following week. It was still early December, and they still had plenty of time left to pick up their cards. I’d been sick and didn’t feel like moving, much less delivering cards or seeing people. I was ready for bed when suddenly the urge to get dressed and go to the post office hit me hard well after midnight. I told Michelle we had to go right then, and she urged me to wait until the following day. But I wouldn’t hear of it. I had to go that night. So, when we got back outside in the freezing night (it was an exceptionally cold night in Florida and a bit drizzly), we heard a tiny “mew, mew” coming from under a bush. We looked and saw a tiny, scared kitten peeking out. Next door to the post office was a construction site with a huge ditch, and next to it was a busy highway. I tried to catch the kitten, but it ran. It was nearly thirty minutes and several scratches and scrapes later before I caught it. We brought it home, and it was starving. We took it to the vet the next day, and they said it was only about four weeks old, too young to have been weaned. They also said there was no way it would have survived the entire night out in that cold. So, we ended up keeping the cat and giving it to my son, who named him Dakota. As his personality developed, he acted more like a “Stewie,” so, while his official name is Dakota, he’s called Stewie more often than not. But without my “gut feeling” and knowing to listen to it, I would’ve never found such a sweet cat and either saved him or had him save us. Talk to me: How often do you have gut feelings about something? How often do you listen to them, even if the timing isn’t convenient? I already told you at the beginning of this month’s theme that I personally believe that either my Asperger’s Syndrome and/or my being an empath is the reason I’m sensitive to so many things such as dream predictions that come true, paranormal experiences, instincts and gut feelings that pan out, messages from the “beyond,” déjà vu, visions, feelings of dread, etc., that turn out to be right on target. That being said, it’s not uncommon when I’m driving somewhere that I might see either a person or an animal, and someone in my close circle of friends who was looking the other way asks, “Are you sure they’re alive?” That always makes me chuckle because, yes, they were alive. (At least most of the time.) My passenger just missed seeing them. A couple of years ago, my niece, Alicia*, passed away. She’d been in the hospital for over a month then moved in briefly with her grandmother, then into a hospice center. While she was in the hospital here in the town where I live, I tried to go see her every day. She lived and worked near me, and I frequently saw her when I was out running errands, and she always had the biggest hugs for her Aunt Rachel. When she was born, her name was Alicia Williamson. * When she was eleven, her mom met and married a wonderful man who adopted her, and her name changed to Alicia Bryan*. During the years she was little, she spent the night with me frequently, and we had a lot of quality time together. When she started high school, she started calling herself Lecy Bryan*. Her friends and even her parents called her Lecy, but her grandma and a lot of her family and I still called her Alicia. She died just a month after her twenty-seventh birthday. A few months after Lecy passed away, I was watching an old black and white sitcom on television, and the star and the guest star were both my Facebook friends. So I posted a status of saying that I thought it was funny that in all my years watching reruns of that show, I never dreamed that one day I’d be social network friends with those two actors, and I tagged them. After I posted that, one of the guest stars Liked my status, then I commented how it made me giggle that said star then Liked what I wrote about him. In the meantime, Alicia’s mother, Marie*, Liked my status. Marie is a very busy woman with two other small children, and she doesn’t often have time for Facebook. Furthermore, unlike me, she doesn’t care for classic TV, so it was quite odd that she acknowledged my comment, but otherwise, I didn’t think much of it. Suddenly, the feeling was gone. For the first time in eight days, there was not an oppressive weight on my chest, and I didn’t have the feeling I was being watched. I finished washing the dishes, then turned on my computer and checked my Facebook. I immediately called Marie, and she, too, was a bit freaked out by that notification and even more so when I shared the whole story. She said she had been upset thinking about Lecy the past few days, but it actually brought her some comfort seeing her name like that out of the blue. She felt it was definitely an omen of sorts. A lot of people might say this was merely a coincidence, but as I’ve told you before, I personally don’t believe in coincidences. And even when I tell this story out loud today, I literally get goosebumps which assures me that it was meant to be. Time to talk: Have you ever been thinking of someone who was deceased then seen someone else with their same name somewhere? If so, how did you feel? Do you believe there are coincidences or that everything happens for a reason? Since today is my son’s birthday, I’ll make today’s theme post about him. When Jeremy was born, my hospital room number was 356. At the time, Florida had only recently enlisted “Cash 3” in its lottery games. I’ve never been one to play the lottery very often, but perhaps about once a year, I play for fun. However, that day, I told my family we should play 356 on a Cash 3 that night. (This was odd for me, because I’ve never been one to take the numbers given to me by any particular event, but rather I prefer to select them myself.) No one listened to me, and of course I was in no position to go out and buy a ticket. Well, you guessed it… That was the number that won that night! It was a $117 payout for a $1 ticket. In 2003, when Jeremy was nine, we lived in Orlando. Whenever a space shuttle would launch, if it was during work or school hours, his school would go outside to watch as it took off, and my co-workers and I would stand at the windows and watch. On January 16, 2003, the Space Shuttle Columbia launched. At the time, I was watching out my office window, and Jeremy was with his class out on the field. A short time later, Jeremy’s third grade teacher called me and asked me to come pick him up. (This was not unusual, because with his Asperger’s Syndrome, he frequently disrupted his class.) She said that ever since the shuttle took off, Jeremy started telling everyone that would listen that the shuttle was, “Not ever going to come back to earth,” and that several children in his class were quite upset by his repeating this. At the time, neither his teacher or I (or Jeremy) had watched the news where it was reported that less than two minutes after the shuttle took off, a large piece of it broke off. For the next several days, Jeremy was like a broken record as he looked into the sky and emotionlessly said, “That shuttle’s never coming back.” (With Asperger’s Syndrome, he has little to no empathy and had no clue why he was being offensive or inappropriate.) He kept saying it so often that his teacher phoned me several more times to try to make him stop. Well, of course you already know the rest. On February 1, 2003, the shuttle blew up upon reentry to the atmosphere! Upon hearing the news, Jeremy simply said, “I knew it,” and he never spoke of it again. Talk to me: Do you remember the Space Shuttle Columbia disaster? What space shuttle event do you remember most, and where were you when it occurred? If a kid in your third grade class made such a bold prediction, would it have frightened you?